In less than 30 minutes, reproduce an authentic restaurant quality Punjabi dry chicken curry recipe at home. This low carb Keto chicken recipe is a breeze to make and is also an Instant Pot Gem recipe that you can also make on the stovetop in a wide pan or wok. HOW DARE YOU CALL THIS A CURRY? IT’S DRY! WHERE’S THE SAUCE? I have news for you. For most Indians, a curry is anything that was cooked using water. Imagine our confusion when people tell us they don’t like curry. You don’t like anything that’s been cooked with water? How sad for you! So we are perfectly capable of making a dry okra dish–and calling it a curry. A dry chicken curry is called sookhi murgi where sookhi = dry, murgi = chicken. Of course, if I titled this recipe Keto Low Carb sookhi Murghi, how many of you would have been searching for it? Exactly. And I hate for you to miss out on this deliciousness. WHAT IS THIS INSTANT POT GEM OF WHICH YOU SPEAK? AND DO I NEED ONE TO MAKE THIS INDIAN DRY CHICKEN CURRY RECIPE? Must you have it for this recipe? No, you don’t have to. All you need is a wide 10-inch saucepan and you should be good to go. I used my Greenpan Magneto the second time and it cooked fabulously. Heat your Instant Pot Gem on sear/Sauté to 400F or on the stovetop, heat a nonstick 10-inch pan and when it's hot, add in the oil. You want a wide saucepan. Note that I cut the ginger quite small. I made coins, then I made matchsticks, then I cut the dice. You want to do this so you don't get a huge chunk of ginger in any one bite. Now, you're going to cook this lovely, fragrant mixture until it is all well cooked. Do NOT add water. Do NOT cover. Stir once in a while. This is the point you'll be happy you listened to me and used a nonstick pan or the Gem. As the chicken and tomatoes cook, you're going to see the water evaporating, the tomatoes caramelizing and mushing up--and most importantly, the oil separating. Some of this oil is what you added, some of it is what's being rendered out of any fat that was on the chicken. It will be difficult to make this dish in the Instant Pot as I know several of you will ask. That is to say, you can't cook it under pressure and get a dry dish. BUT. There's nothing keeping you from cooking this on Sauté in your Instant Pot Pressure cooker. What kind of tomatoes do you use here? Also, a number of your recipes don’t specify the kind of tomato that you use. Does it matter? Do you have a preferred type? I’m still working on my cooking skills and don’t know how much that sort of thing matters. I’ve been working though your book and it’s been great for moving towards healthier, home-cooked food. Thank you! Delicious! I used a cast iron skillet and chicken breast and it turned out great! My husband says 5 stars. OMG this was so good! I could’ve eaten the entire 1.5 lb of chicken myself. Thank you! Made this tonight and it was amazing! Not all dishes live up to their cooking aroma, but this one sure did. If you’re thinking about skipping this recipe it isn’t a “set it and forget it” Instant Pot pressure cooker recipe (like I almost did) – don’t! It’s very easy and the payoff is worth it. I will definitely be adding this to the regular rotation. Thanks for sharing! I used chicken breasts and it turned out great! So this one is in the Gem which isn’t a pressure cooker. Tried this last night and loved it! I did add some salt though. 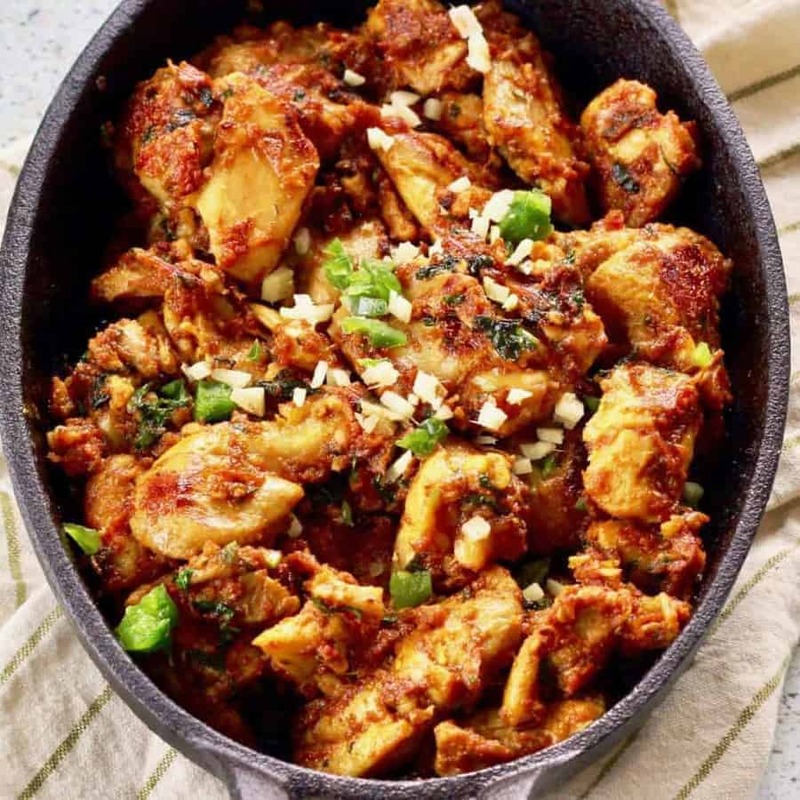 I think your technique for this dish is wonderful, and I might adapt it for other spice combinations – such as lemongrass and ginger instead of garam masala and turmeric, just for variety from time to time. I’m really impressed that you can make such a tasty dish with hardly any fat. Can’t WAIT to try this, so yum!! Pinning! Also, your ‘gem’ link is not working when I click it. Again?! Ugh those dang links keep breaking. Thanks for letting me know.